California Nurses Association members rally to petition OSHA for a formal standard on preventing workplace violence. March 16: This article has been corrected to accurately reflect that the Occupational Safety and Health Administration can require employers that have violated the general duty clause to take corrective action. The original version incorrectly stated that OSHA did not require employers to take corrective action or require inspectors to follow-up. Last December, at about 2 a.m. in the intensive-care unit, Allysha Shin's patient attacked her. Shin, a neuroscience nurse, was carefully monitoring the patient, a woman in her 20s who'd suffered a hemorrhagic stroke. She'd begun her usual overnight shift accompanied by a sitter, a person who helps supervise or care for high-need patients. The sitter was called away after two hours to attend to another patient. Later that night, Shin's patient, whose stroke had likely affected her behavior, grew agitated. She twisted in the restraints that bound her wrists, kicked Shin in the face and punched her. Then, she ripped away the restraints. Shin yelled for help. It took four nurses, a nurse's aide and other staff to wrestle the patient into a chair. In the process, she kicked Shin several more times in the chest and stomach. Shin, who works at Keck Medicine at USC in Los Angeles, took the next two nights off, her body aching from the attack. In a statement, Anne Sy, Keck's chief nursing officer, acknowledged the incident but said she could not speak to the details. “Keck Medicine of USC takes the safety of our staff and patients very seriously,” Sy said. The medical center encourages all hospital staff to speak up when violence does occur, she added. Violence in healthcare settings has risen steadily in recent years. That has taken a growing financial and human toll on the nation's 15 million healthcare workers and on its hospitals and long-term care centers, and has prompted executives, providers and policymakers to take action in myriad ways. Hospitals have debuted technologies and launched awareness campaigns. States have proposed laws requiring workplaces, including in healthcare, to establish anti-violence protocols. Unions have pushed for minimum nurse-to-patient ratios. The violence is due to a confluence of factors that defy easy solutions. In healthcare settings, nurses, aides and other caregivers are often shouted at, hit, kicked, beaten and shoved. The majority of the time, patients mete out the abuse—sometimes intentionally, sometimes not. In other cases, it comes from visitors or other staff. In one notorious incident, in 2015, the son of a former patient shot and killed a cardiovascular surgeon at Brigham and Women's Hospital in Boston. Such violence not only poses a threat to people—nurses, physicians, healthcare staff, patients and visitors—but it also drives up costs and undermines both the quality of care and patient outcomes. Yet fashioning an effective response to the violence that routinely occurs in clinics, hospitals, nursing homes and other medical facilities has long frustrated providers and their advocates. 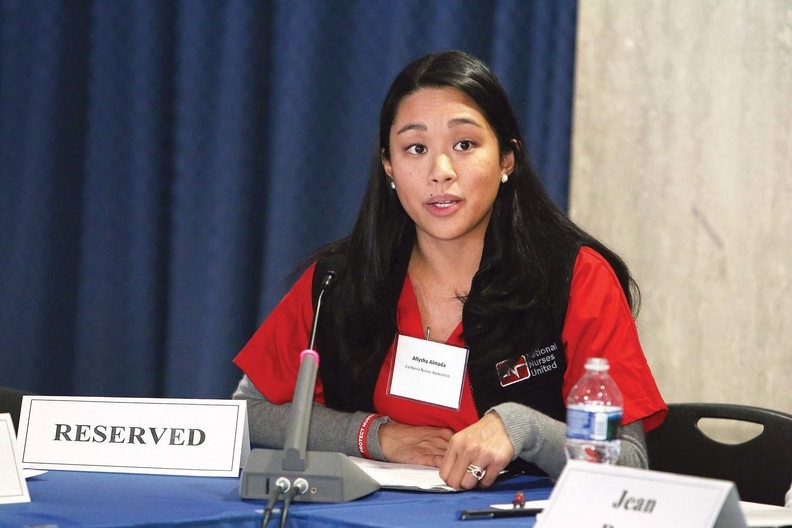 Allysha Shin, who was injured in an incident at Keck Medicine, spoke at an OSHA conference on violence in the workplace in Washington, D.C., in January. Violence in healthcare settings is measured poorly. Less than half of incidents are recorded—one survey estimated just 19%—and official accounting by government agencies such as the Bureau of Labor Statistics, the U.S. Justice Department and the Occupational Safety and Health Administration vary widely. Studies and surveys often classify violent incidents differently, which leads to discrepancies in quantifying the problem. In 2011, the number of nonfatal violent incidents in healthcare facilities ranged from 22,250 to 80,710, the Government Accountability Office estimated last year..
What is known is that healthcare workers, especially direct care providers, face far higher risk of being injured on the job than workers in other industries. 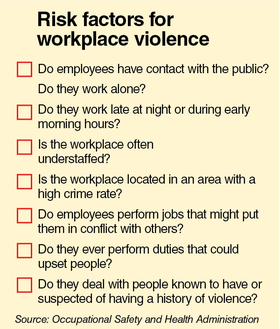 In 2014, 52% of workplace violence incidents reported to the BLS occurred in healthcare. More than half of nurses and nursing students have been verbally abused and more than 20% physically assaulted, according to a 2014 survey of 3,765 registered nurses and students conducted by the American Nurses Association. Homecare workers face similar perils, with 18% to 59% reporting verbal aggression and 2% to 11% reporting physical assaults. Physicians, especially in emergency medicine, are targets, too. These injuries take their toll on both the wallets and psyches of the affected workers. Injured employees might miss work or need medical care, which typically comes out of workers' compensation insurance. It also takes away from hospitals' bottom lines. One hospital spent just under $79,000 on medical treatment and $15,000 on indemnity in one year, for 30 nurses injured by workplace violence. In some cases, violence pushes workers to leave healthcare altogether, at a time when they are desperately needed. From 2014 to 2024, the ranks of registered nurses are projected to grow from 2.75 million to 3.19 million, the Bureau of Labor Statistics has projected. The number of jobs for home health aides, totaling about 913,500 in 2014, is on track to grow a whopping 38% over the same period, adding 348,400 jobs. The number of actual job openings is expected to be even higher. According to a 2015 report by researchers at Georgetown University's Center on Education and the Workforce, 1.6 million jobs will open for nurses from 2015 through 2020—700,000 of them newly created and the rest to replace retiring nurses. By 2020, the U.S. will have a shortage of 193,000 nurses, they projected. Nurses and hospitals are already feeling the pinch. “I've been doing this for 20 years, and I don't remember staffing levels this skeletal,” said Lisa Wolf, a registered nurse who is director of the Institute for Emergency Nursing Research at the Emergency Nurses Association. When nurse-to-patient ratios fall below a critical level, the risk of violence increases, advocates for nurses say. The body of evidence showing that staffing levels directly correlate with violence on wards is sparse, according to Gordon Gillespie, a nurse and associate professor at the University of Cincinnati's College of Nursing. During his 21 years in nursing, he has witnessed that violence is most likely to erupt when staffing drops below a critical level. Patients sometimes resort to violence to catch nurses' attention, he said. The more patients that nurses and other providers must care for, the less time they can spend with each. And the more overworked they become, the harder it is for them to catch warning signs and stave off brewing violence. When frontline providers are stretched thin, there are also fewer of them to respond to violent incidents. They could be in another room attending to another patient—as was Shin's sitter the night Shin was attacked. “Many hospital staff nurses will tell you there is definitely a shortage,” Cipriano said. The reasons vary, according to Cipriano. Some hospitals try to cut costs by hiring fewer care providers. Others have stressful environments that result in nurses' burning out and leaving. Still other hospitals struggle to hire nurses because of geography—they might be in a rural area, or their region might have a dearth of nursing graduates. Keck Medicine, where Shin is a nurse, trains staff to deal with patients who might be delirious or agitated, said Sy, the chief nursing officer. The training includes approaching an agitated patient, preventing injury, de-escalating situations and getting help. “We're confident that our training program helps prepare our staff for when these situations arise,” Sy said. Some hospitals and health systems are turning to technology and awareness initiatives to curb violence. In September 2015, the emergency department of Valley Hospital, in Ridgewood, N.J., distributed a 10-question survey about workplace safety to nursing staff. The following month, the hospital required all ED staff to complete an online evacuation training program. The department also created a special team for de-escalating risky situations without using physical force, spending about $10,000 to train 90 staff members. It also gave nurses, physicians and other frontline staffers the option of wearing a badge with a built-in alert button. If they feel threatened, they can discreetly press the button to notify security and the charge nurse. As these initiatives were implemented, the number of injuries declined, from 45 and 55 in 2013 and 2014, respectively, to 26 in 2015. But in 2016 they rose again, reaching 27 by mid-September, according to the ANA.. These efforts to curtail violence by increasing awareness or deploying new gadgets may amount to no more than Band-Aids, especially in the absence of stricter regulatory standards and enforcement. “One of the challenges is that we have no national standards,” said Gillespie, of the University of Cincinnati. Since 1996, OSHA has offered voluntary guidelines for healthcare and social service workers. . Last updated in 2015, the guidelines state that “a written program for workplace violence prevention, incorporated into an organization's overall safety and health program, offers an effective approach to reduce or eliminate the risk of violence in the workplace.” They also list the building blocks of such a program. OSHA can't enforce those guidelines or require employers to implement prevention programs. What it can do is cite employers for violence in healthcare settings under the Occupational Safety and Health Act's general duty clause, which requires employers to provide a workplace free from hazards. But OSHA inspectors must meet a high burden of proof in order to issue citations under that clause. The agency does require employers to take corrective action, but it can't tell them what to do, specifically. Rather, it gives them a list of possible remedies from which the employer must choose. In recent years, OSHA had become increasingly dependent upon the general duty clause to enforce compliance in healthcare settings, Barab said. Meanwhile, labor unions, Congress and professional associations were highlighting the issue. 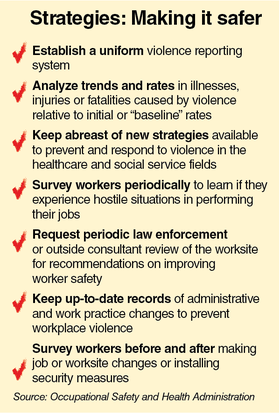 Some called for OSHA to create a standard to keep healthcare workers safe from violence. In January, OSHA began rulemaking to do so. It is gathering input from stakeholders until April 2017—the early stages of a process that ordinarily takes five to seven years. Under the administration of President Donald Trump, who issued an executive order requiring the removal of two regulations for every new one approved, the timeline for that rulemaking is uncertain. For now, OSHA can cite employers using a process that Barab sees as highly burdensome. In the absence of federal rules, nearly a dozen states have enacted laws requiring healthcare employers to create plans or programs to protect workers from violence at work. Often, violent incidents are the trigger for such legislation. These laws vary considerably in substance and scope. New Jersey's law encompasses the healthcare sector, but Maine's includes only hospitals, for instance. Forty-two states, according to a compilation by the American Nurses Association, have varying penalties for assaulting first-responders. In a handful of those states, the penalty applies only to emergency or psychiatric department staff. “That (penalty) does not seem to have been a significant deterrent,” Cipriano said. The industry contends that nurse-to-patient ratios add costs without improving care and impose inflexible requirements. In 2013, in a comment on a bill to mandate nurse-staffing ratios, the the American Hospital Association said it opposed “a cookie-cutter approach to patient care.” The association did not respond to queries for this story by deadline. Skilled-nursing and assisted-living facilities have lately reported increased violence against employees, said Dr. David Gifford, senior vice president for quality and regulatory affairs at the American Health Care Association/National Center for Assisted Living. He attributed the uptick primarily to growing numbers of patients with mental health issues, dementia or Alzheimer's disease. Despite the widespread recognition that violence in healthcare workplaces is a growing problem, there's little agreement on how best to quell it. An April 2016 editorial in the New England Journal of Medicine pointed out that most research is geared toward quantifying the problem rather than studying how to solve it. The sitter assigned to stay with the neuroscience nurse at Keck, was called away because another room, which had two patients, needed a sitter, Shin said.